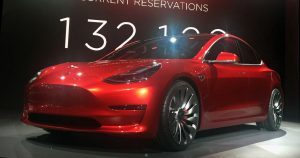 Tesla's New Model 3: First Affordable Car From Musk? Tesla’s New Model 3: First Affordable Car From Musk? The model has recently been revealed to Tesla’s employees and customers at an exclusive event which took place outside the Tesla factory in Fremont, California. 30 lucky customers collected their first Model 3s at the event, Tesla CEO Elon Musk had also revealed that 50 cars have been produced so far. However, it has been announced that the official production will not begin until past mid 2017 and with 400,000 people already queuing to receive the Model 3, you may have to wait until late 2018 to be able to drive one of your own. UK road drivers will be even less fortunate, with the production of the right-hand side cars not set to begin until early 2019. 3. ‘Use that money to create an affordable, high volume car’. This reveal of Musk’s secret plan came just 2 years before the first Tesla (Tesla Roadster) was ‘released’ onto the road. However, since then the company has become more and more popular, especially with the growing concerns regarding the climate change and growing demand for alternative fuel power. Elon Musk created Tesla with a great understanding of the gap in the auto market and filled it with a completely unique approach to car making. The 2040 petrol and diesel fuel ban plan couldn’t come earlier for Tesla and their anticipation for a boom in the company’s acquisitions. This doesn’t necessarily mean that other car manufacturers will not try to compete with the electric energy car giant. However, being the leaders who quite literally only concentrate on creating such vehicles – they will be hard to overturn. We can’t wait to see what else Tesla will have in store for us!